Trying to balance work and home life can be difficult, and many parents say they don’t have enough time to spend with their kids. According to a survey conducted by Wakefield Research for Nintendo*, parents tell their children they are too busy to play with them an average of eight times a week, with almost half of parents (48 percent) saying they spend more time commuting to work than playing with their kids. But simple things like playing a quick video game as a family, which tops the list of activities that kids enjoy most (33 percent), can be easy and fun. “Between busy school and work lives, quality family time is becoming more and more limited,” said Meredith Sinclair, a lifestyle expert in play and family time. “What’s so great about Mario Party Star Rush is its ability to bring families together to play something that everyone will enjoy. 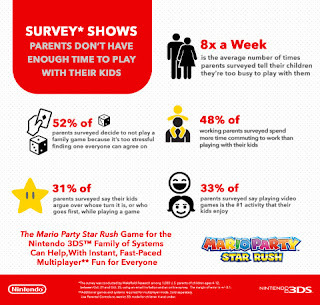 Families will be making an effort to schedule more game nights and to find time to play together.”Now families can play as iconic characters like Mario, Luigi and Peach in Mario Party Star Rush, a fast-paced, portable multiplayer game that is now available for the Nintendo 3DS family of systems. Mario Party Star Rushoffers something for everyone and can be played for as long or as little as families have time for. The engaging and colorful game launched on the same day as seven new amiibo figures in the Super Mario series, which are sold separately and can be used to expand the fun. More than half of parents (52 percent) frequently avoid playing family games because it’s too stressful to find one game that everyone wants to play. Other challenges include kids getting too bored (36 percent) or arguing whose turn it is (31 percent). All of these pitfalls can potentially be avoided when playing Mario Party Star Rush. In Mario Party Star Rush, players take turns simultaneously, blazing through mini-games, roaming game boards, rolling dice and teaming up with Mario, Peach and other fan-favorite characters to face down bosses. There’s no time to be bored! Mario Party Star Rush is packed with seven different fun modes, so everyone, regardless of their gaming skills and interests, will have a blast. Kids and their parents who have fond memories of Nintendo characters will love the new Super Mario series amiibo figures that launched on the same day as the game and are sold separately. These figures include the debut of Daisy, Waluigi and Boo (who actually glows in the dark! ), as well as new poses for Donkey Kong, Diddy Kong, Rosalina and Wario. By tapping a compatible amiibo to the New Nintendo 3DS XL system (or to a Nintendo 2DS, Nintendo 3DS or Nintendo 3DS XL system using the Nintendo 3DS NFC Reader/Writer accessory), players can gain teammates, gain items or enjoy other features while playing in different modes. When only one person owns that game, up to three other players can connect to try out a limited number of multiplayer modes. Additionally, anyone who doesn’t yet own the game can download the free Mario Party Star Rush – Party Guest Edition software available exclusively in Nintendo eShop. Up to three players can then connect with a player that owns the full game so all four players can participate in the full multiplayer experience together. That makes playing together as a family easier than ever! Mario Party Star Rush is now available in stores, in Nintendo eShop and on Nintendo’s online holiday gift guide at a suggested retail price of $39.99. The new Super Mario amiibo figures are also available in stores at a suggested retail price of $12.99 each. For more information about Mario Party Star Rush, visit http://marioparty.nintendo.com/. For more survey results covering family dynamics relating to video games, travel and free time, among others, please contact Michelle Mandara at 212-373-6051 or mmandara@golin.com. *The survey was conducted by Wakefield Research among 1,000 U.S. parents of children ages 4-12, between Oct. 21 and Oct. 25, using an email invitation and an online survey. The margin of error is +/- 3.1.